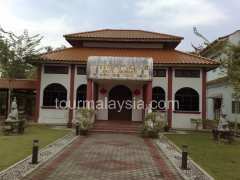 The temple was founded by late Dato Kor Thian Peng, he was said a foster son of late Johor Sultan. Dato Kor is a legendary person, the only temple medium conferred with a datukship for his role in curing illness of a member of the royal family. According to legend, the temple divine god protected devotees who were chased by rioters during 513 racial riots. The story has attracted droves of devotees from local and Singapore flocking to the temple for prayers especially during the birthday of divine god. A Chinese primary school is attached to the temple, it also the only school directly sponsored by a Chinese temple in Malaysia.